The analogy of how Pinklebury Farm is managed should provide an easier understanding of how the key concepts in the world of Citrix XenApp work. By taking a look at the key concepts again technically, an understanding of how they work can be more clearly understood. This is a computer which hosts, that is, has the applications (word processor, web browsers etc.) 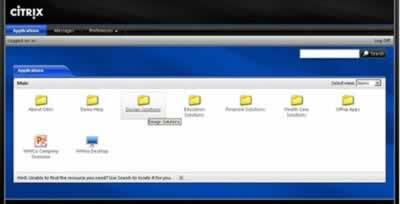 installed on it and provides access to these using Citrix software. This server runs a server based operating system (Windows Server 2003, Windows Server 2008 or Windows Server 2008 R2) and is configured to use Citrix XenApp software. The Citrix XenApp software provides enhancements to Windows Server Operating System in terms of application delivery and management. The Windows Server Operating system requires Terminal Services (Remote Desktop Services and Application Server roles if Windows Server 2008 R2) configured. A Citrix XenApp farm is a collection of Citrix XenApp servers, which share a Datastore. The Citrix Datastore just a database on a database server and a single database server can have several databases, acting as unique datastores for different XenApp farms. 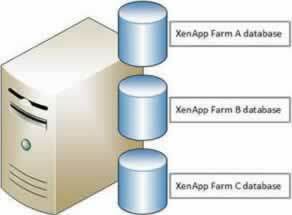 For example, the screenshot below shows XenApp Farm databases on the same server. The datastore provides a permanent store for XenApp farm information until a time it is changed or removed. The Data Collector holds an in memory database of XenApp server information, monitoring their states and available capabilities. A web based front end where users log in and get presented with information about applications they are allowed to use. The web interface talks to an authentication service such as Microsoft Active Directory, to determine whether the user is allowed access to the Citrix XenApp farm via the Web Interface. If the user is allowed access, the web interface then speaks to the XML broker and asks it for a list of applications the user is entitled to use. The icons (images with shortcuts, as shown in the screenshot (Web Interface displaying applications and folders) below, are then displayed on the web interface web page. When these icons are clicked they launch the remote control access to the applications on a particular Citrix XenApp server. The screenshot below show Web Interface displaying applications and folders. To partition XenApp Servers into groups, XenApp zones can be used. Each zone must have a Citrix XenApp server configured as zone data collector. Whilst it is possible to separate Citrix XenApp servers into separate farms, this would require increased administration and additional components in comparison to partitioning XenApp servers into zones. As stated in the Web Interface section, the XML broker is an intermediary for the web interface to find out which applications are available to the user. The XML broker is a program which runs on a server. It is known as a service for two reasons, firstly it provides a service, that is brokering information and secondly, it carries on running on the server listening for requests from the web interface, even when there is no one logged on to the server.